How many times am I going to write about parents behaving badly at their own kids’ sporting events? My latest rant stems from last Saturday’s U10 soccer game between my younger son’s team and their local rivals. Tom warned me going in that it wasn’t going to be pretty. Hoo boy. He sure wasn’t kidding. The game was heated. An opposing player may or may not have tripped a player on Tom’s team, but the ref called a foul. And then the little opposing player said, “Are you f***in’ kidding me?” to the ref. 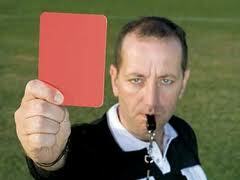 The referee heard the remark and gave the young player a yellow card. “Hmmm. It doesn’t take a rocket scientist to figure out why a young player on that team would feel entitled to express his displeasure with the referee’s call. Just look at the coach. While I find any behavior of this sort abhorrent, it’s especially disturbing given the context. It’s a recreational soccer game. These children are 9 and 10 years old. The stakes are non-existent. Seriously, it’s not worth developing high blood pressure over whether a referee made a proper call. So far, I’ve heard nothing from any of the board members who received my letter. It’ll be a week tomorrow. Here’s the problem, people. Adults watching their children playing team sports have lost all perspective. I grew up barely after Title IX took effect, so most girls I knew didn’t play team sports before junior high or high school. Some boys did play Little League, but I don’t remember their parents going ape over their kids’ freakish athletic ability, plastering their cars with sport clings with their kiddos’ name and number on it, driving all over Hell’s Half-Acre to watch them play whatever sport they played. And that would mostly be because the parents were busy with other things in life and saw sports as a diversion and learning experience to keep kids busy until more important things came along – like school and jobs. But I think I’m in the minority. Amen. I have three kids who have all played various and sundry sports throughout their childhoods (oldest is now 23, youngest is 16.) Soccer wasn’t too bad when the boys were young, because it was still a fairly new sport and most parents hadn’t played it themselves. Ignorance is bliss, and all that. Baseball in all its forms – t-ball, coach-pitch, kid-pitch and softball – were spectacles of parents going apey. Crazy. After a few seasons, we retreated to soccer only, then swimming for #3. I agree with your assessment of the whys, and would only that we live in a world where every parent honestly believes their kid is going to be the next Kim K (or Kris, if sports is their bent). They see the stakes of even rec league as being very, very high; college scholarships, professional contracts and endorsements are all riding on that kid’s performance, at least in their mind.) Did I say crazy? Yeah, it’s off-the-charts delusional craziness. I’ve long been for rec leagues being structured informally into pick-up games. You show up for scheduled practice or game day and you get tossed a white or colored jersey, and you get out there and have some fun. Learn the sport. Learn to be a good sport. If you’ve got the chops, there will be plenty of time and other places to be the next athletic superstar. Sing it, sista! I totally agree. Why doesn’t the world listen to us??? Honestly? Most moms (and dads) don’t seem themselves as the deranged lunatics they turn into when it comes to kids sports. I have cited the stats to parents who are banking on their kid’s throwing arm: less than 10% of the state’s top HS seniors will be offered an athletic scholarship (full or partial). Something like 3% of the top college players are recruited professionally. Parents nod like they understand but in their minds, their kid will be that elite athlete, and the astronomical odds against them can go pound sand. Shrug. I hope the tide turns by the time I have grandkids!